It’s now almost 7 years since I have started playing EvE Online. Since the first days playing it, I understood EvE Online is superior and different to the other games. EvE Online is one of the handful of “evergreen MMOs” that survived whole technology eras. It’s also one of the even fewer ones that did not massively decline in subsciption counts, and this despite having had difficult times and even some scandals which would have burned many a prominent MMOs. Many times I have asked myself: “there’s something missing in the picture”. Let’s be frank. EvE Online is not exactly a game catering to the millions. 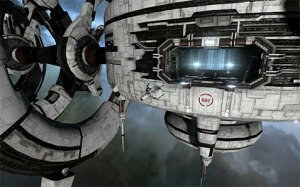 EvE Online is not exactly “super cool looking”. Well, it is, but not in the mainstream “shiny candy” definition of cool. EvE Online has spaceships… but it’s hardly alone. It features “harsh consequences for dying” but other MMOs do that too. EvE Online has an awesome economy and functional markets. But even that, has been implemented by other games. Same for industry and research. So, what makes EvE Online… EVE Online? What makes EvE Online superior and different? I think there are two reasons: a more obvious and known one, and a less obvious one. EvE Online puts all of the above features together in a credible and solid whole. It’s not just spaceships or industry or REST API… it’s all of them in one. 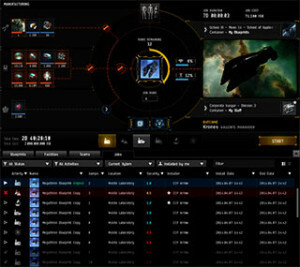 EvE Online is a, if not the, precursor to social networking media. This is easy to explain. Every player who becomes a long term “citizen”, understands that EvE Online is superior and different to the other games because it puts so many different “subsystems” together and does it in a convincing way. There are indeed MMOs which may claim “crafing schools” superiority over EVE Online. There are others fully employing the latest DirectX /OpenGL technologies to look awesome. There are others with segmented regional markets. But they sport those features as their one distinguishing trait… the rest of the game is usually nothing to speak about. On the contrary, EvE Online has all of this and more. It comes with its weak or even very weak spots (Tyrannis with its Planetary Interaction was not exactly the best of the best) but on the whole it manages to blend an ever increasing, huge amount of separate features into a whole. So, you may go to a believable market or accept a believable item contract and get your stuff. With that stuff you may believably create a lot of items (different degrees of quality, invention, involved logistics, production facilities using conummables..) including a whole, fitted spaceship. Or station. Or whatever. And then you may believably get out with it and go believably lose it (or not!) against believable, human driven opponents, members of believable organizations. I have actually skipped a lot of steps, as in EvE Online you may prefer to really produce “everything from the ground up”, basically from the most basic, unrefined primal minerals to supercomputer components. You might want to get them from planets, from abandoned installations, from deep space pockets, from distant “null security” lawless space, smuggled through civilized space or even go inside dangerous and unknwn worm holes and try your luck! In the next page I cover the other reason why EvE Online is superior and different.